WeatherTrak™ includes sensors for irradiance, panel and ambient temperature. 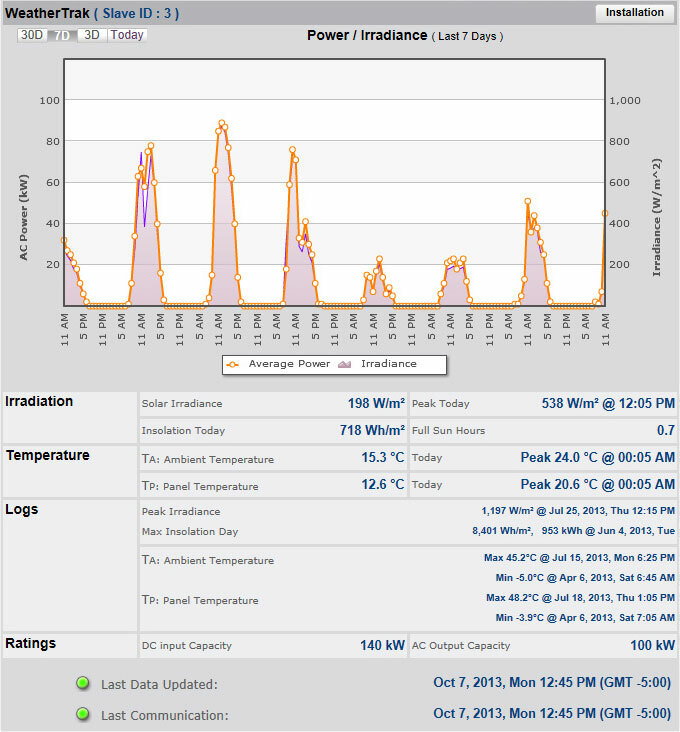 Daily insolation, energy and peak irradiance are recorded for viewing graphically or downloading for analysis. Logs track sensor minimums & maximums since last user reset. Check that the system output meets specification under actual conditions of irradiance and temperature. Evaluate panels from different vendors under real conditions. Set an irradiance threshold to receive a SunLowPower warning if any inverter is not producing power as expected for the measured irradiance level. When an email alarm is received with the inverter ID, use the Analyzer tools to view all measured inverter values to identify and quickly fix the cause, minimizing lost revenue.